Holiday Mountain Ski & Fun Park offers convenience and a scenic drive into the mountains, just 90 minutes from New York City. Holiday promises a friendly, relaxed atmosphere that families enjoy. The beginner area and Snow Sports School, as well as special deals like the "Kinderski Program" for ages 4-6 and "family night," make learning a pleasurable experience for all ages. There are nine trails for skiers and snowboarders, as well as four tubing trails. Ski chalet. 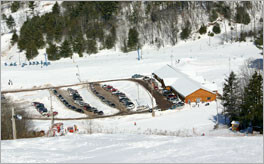 Ski shop and first aid at the area with additional shopping in Monitcello and a hospital four miles away. Ski rental (including helmets) and repair along with group and private lessons. School programs and kinderski for children aged 4 to 6. One-hundred percent snowmaking. Get Snow Reports, Powder Alerts & Powder Forecasts from Holiday Mountain straight to your inbox!